The School Resource Officer, P.O. Michael Camporeale is assigned full-time to the Pascack Valley/Hillsdale School System and plays an integral part of the day-to-day interaction between the youth of the community and the police department. In an effort to have a police officer readily available in the schools, and to have a police officer able to mingle with students o­n a regular basis, forming a rapport with the student body, the School Resource Officer position was created and instituted in the Borough of Hillsdale. P.O, Camporeale reports daily to the Pascack Valley Regional High School, the Hillsdale Public Schools as well as the St. Johns School. 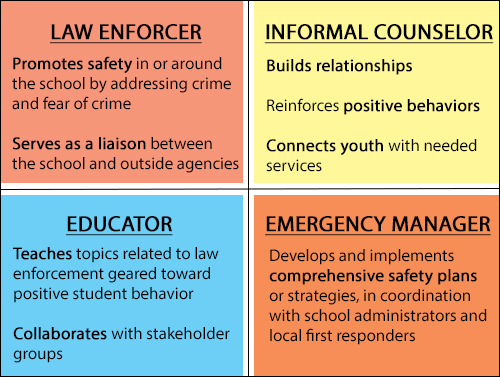 During those visits, the SRO performs a variety of tasks from crisis intervention to truancy investigations. P.O Camporeale's role is extensive, as he offers much to the student body, faculty and staff of the Boro's schools. P.O. Camporeale's years of patrol experience, as well as years of instructing DARE and other programs, made him a clear choice for the position; he offers much to the school and its students as their new School Resource Officer. As a consistent, positive influence in their lives, P.O. Camporeale spends the entire school year with the youth of Hillsdale. P.O. Camporeale fosters a friendly environment with the students, having a clear open-door policy at his office located o­n campus at PVHS.